Vicki Kim of Ruxbin presented her group's new concept and its desire to lift the liquor moratorium. The Ruxbin Kitchen team wants to open a wine shop [the address has been withdrawn from this post at Kim's request]. They are looking to acquire a packaged goods license only, and to sell wine but not serve it. The board examined whether the location is too close to Wells High School to qualify for a license, too close to other packaged goods stores, and too likely to attract more liquor sales. The question was raised as to why not go for an incidental license (for restaurants in which liquor sales are "incidental"), which the neighborhood might find more acceptable. Kim said that would require that Ruxbin have a handicap-accessible bathroom, and that would take away too much seating in an already small restaurant. 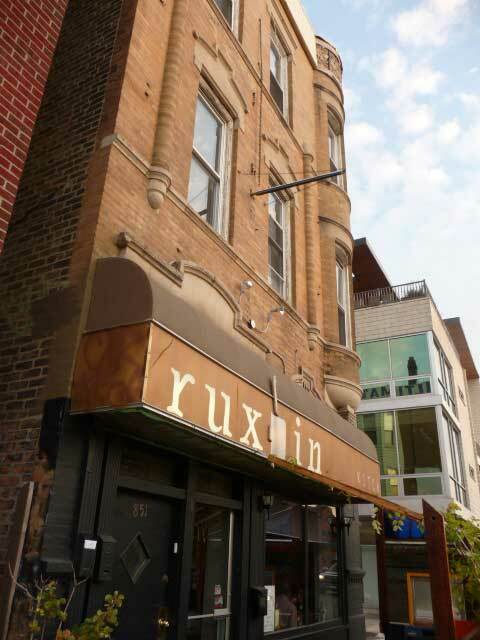 Scott Rappe and Neal McKnight of the board will schedule a time to meet with the Ruxbin team to brainstorm solutions to satisfy both the Ruxbin group and the neighborhood. McKnight also suggested that they would analyze which properties could open package liquor stores if the moratorium is lifted. Finally, McKnight and Rappe will speak with the alderman about supporting an EVA proposal. Tom Tomek will wait to order the brackets to install signs until Greg Nagel speaks with Raymond Valadez from Ald. Proco Joe Moreno's office about how signs can be installed. Anne Shaw asked EVA to support having the Wood Street police station remain in operation. Since the new city budget would be released in two days there was not time to bring the question to the membership. After discussion, Greg Nagel made a motion expressly stating that EVA supports maintaining the police station. The motion was seconded by Tomek and passed with 4 in favor, 2 opposed and 1 abstaining. McKnight agreed to draft a letter regarding the station. Tomek won the membership meeting contest for most fliers collected. Stephen Rynkiewicz will put a request online for more to be brought to next EVA membership meeting to be dropped off to the alderman to show the range of fliers being distributed and the neighborhood's desire for the handbill ordinance to be enforced. Mark Duntemamn is almost finished with the map of the neighborhood, McKnight said. He will request Duntemann to be the speaker at the November membership meeting to give us an update. The city Department of Forestry also will be requested to present. Ruxbin agreed to be the business minute for the November meeting. McKnight will ask Roots to be the party location. McKnight is waiting to see the revised proposal for 1601 N. Ashland. Kung Fu Liquors is requesting an upzone to C at 1225 N. Milwaukee. The board's position is to not support the upzone in favor of an incidental license. Rappe and McKnight will draft a letter for the alderman with the board's position and set up a time to meet with the alderman about this issue. I live in the neighborhood. I wasn't able to attend the meeting because my work ran late, though I wanted to. I am curious about the liquor moratorium. How was/is that decided? Is it something that the City Council legislates or is there some other municipal board or somethign? Do they decide based on the advice of the neighborhood? And does "the neighborhood" mean the the EVNA or is there some other mechanism by which the neighborhood renders its advice? I am not being critical or anything, I just want to get involved in neighborhood stuff in general and was just curious as to how the process worked. The City Council froze new tavern and packaged goods licenses after concentration of liquor stores became a community issue. Police still cite them as contributing to Ashland-Chicago crime, so the issue is how to limit unintended consequences of lifting the moratorium.